Megan and I made a purchase that we've been wanting to make for a long time. We bought new bikes over the weekend. This evening we took them for a spin along the Olentangy bikeway, a trail that I've seen hundreds of times, as it runs just across the river from our usual areas where we explore the river. Even on the bike, the wildflower display was spectacular, both from native and non-native species. These images are from last Thursday, when the flowers were entering near peak. They'll only be around for a few more days, so if you live in central Ohio, be sure to get out soon to take in the floral wonderland! Part of the views along the Olentangy include a rather nasty invasion of a non-native buttercup called lesser celandine. In parts of the floodplain where the river regular flows during high water, this fleshy leaved plant carpets the ground with its yellow blooms. It is no wonder why it was planted as a garden plant. It must have made a fantastic ground cover in any yard, and now, it has escaped to natural areas. Good to see that your Dutchmen finally grew into their breeches. 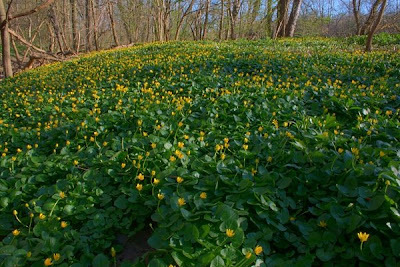 Wow, that Lesser Celandine looks to be seriously naturalized. Tom: That little white flower is really special. I would have never known the name. How fun to ride bikes through wildflowered paths! Love the breeches, and congrats on the new bikes - hope you get tons of use out of them. That's my favorite form of exercise and transportation! Great flower shots. That sounds like a great bike ride. 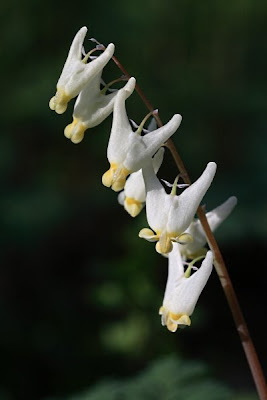 That is a very nice photo of the Dutchmen's breeches. Makes it look as lovely as an orchid or something exotic. Wildflowers have such a delicacy to them. I have yet to find Dutchman's Breeches but would love to see some.